Tens of thousands of residents in a small city of China broke through a police blockade and raided a government building on July 28, at one stage apprehending the mayor and stripping him of his shirt, in an attempt to have an industrial project shut down. Residents of Qidong City were incensed with plans to divert wastewater into an estuary near the city, for a nearby Japanese paper manufacturer. They said the hundreds of tons of pollution that would have been released threatened Qidong’s mariculture (marine aquaculture). 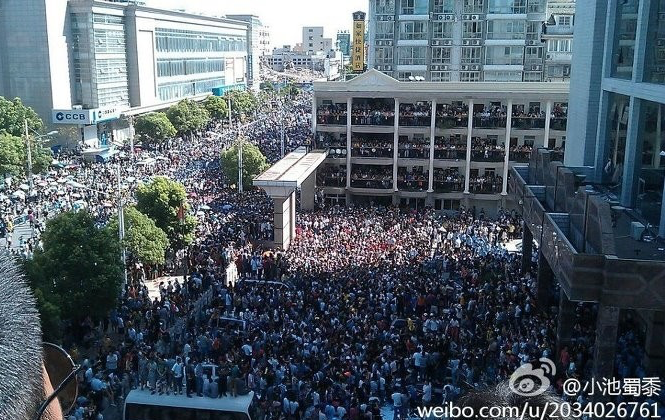 Crowds started forming outside the Qidong municipal government building at around 6 a.m. on July 28 local time, judging from the time posting about the topic got underway on Sina Weibo, China’s version of Twitter. By 6:18 a.m. protesters had stormed the police blockade, taken down the gate, and marched into the city government building. Photographs show residents ransacking the building, and removing documents and luxury goods. At one stage thousands of people had swarmed into the building, while a photograph shows the mayor, without a shirt, being hurried away by police. Protesters had attempted to make him don a T-shirt with anti-pollution messages on it. One photo shows a woman standing on a desk in a government office tipping a larger container of water onto items on the desk. Other shots show piles of ransacked papers and personal items of office workers. Qidong is a county-level city of about 1.1 million in the Nantong municipality of east China’s Jiangsu Province. Nearly a thousand police and armed police arrived soon after the initial incursion and surrounded the residents. 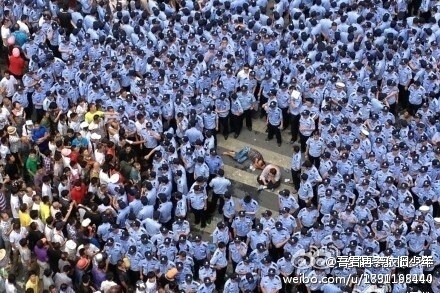 They did not fire tear gas or resort to violent beatings, as is often the case when suppressing mass protests in China. Over 10,000 high-school and college students from Qidong had used social media applications, such as the popular service QQ, to organize the protest and march, according to the Hong Kong-based Information Center for Human Rights & Democracy. A resident who would only identify himself as Mr. Chen told an Epoch Times reporter that the protest saw strong participation from high-school and college students. “The young people were at the very front,” he said. The protest had been announced at least a week in advance, and was advertised with cleverly designed posters. Chen said that local officials put pressure on people not to protest, asked factories to stay open during the weekend, and had residents sign agreements that they wouldn’t take to the streets. The authorities also roughed up a journalist from Asahi Shimbun, a major Japanese newspaper, according to an article the paper published online. Despite initially not lashing out, the police turned violent in the afternoon after reinforcements arrived from surrounding areas. Reports of injuries and at least one unconfirmed death then appeared. Mrs. Huang, another resident, indicated that Qidong police “don’t dare” beat locals, but those from Nantong, which is nearby, were brutal. Some protesters regrouped for an afternoon protest, but the project had already been defeated. Residents are now worried about some kind of violent reprisal.